I've just started reading David Hicks' memoirs. I'm upto the part where he travels to Pakistan and spends time with the Tabligh Jamaat, an international Muslim missionary effort founded in India during the early 1940's. So many young Muslims have been with the TJ at some stage or other, myself included. Hicks has gove to Pakistan after spending some time with the Kosovo Liberation Army (KLA) who were fighting with the support of the United States and its NATO alies. Some fruitloops like to claim that the KLA was ome kind of al-Qaeda outfit. That's a bit like saying that the Vatican is a product of the Sydney Diocese of the Anglican Church. Cynthia Banham reminds us in a column for the Sydney Morning Herald of why Hicks' memoirs are important. Here are some excerpts. ... Hicks's memoirs are an important development for our democracy. Why? The Howard and Rudd governments failed to investigate his allegations of abuse, mistreatment and torture while in US custody. Consequently, this is likely to be our only insight into what happened to him. I haven't yet read Leigh Sales' book about Hicks so I can't confirm or deny this. Then again, I think Sales' book was published when Hicks was still at the gulag. As a liberal democracy, the manner in which our government treats Australian citizens, or permits them to be treated by foreign states, in a time of war or national security crisis - or any time - should concern us. It should concern us unless we are carried away by the hysteria of those who want us to ignore legal obligations and act on our emotions. But Hicks pleaded guilty in a court, did he not? 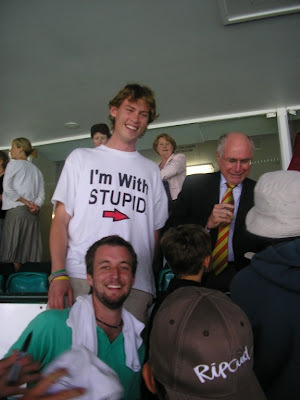 Certainly that was John Howard's line before two shoes were thrown in his direction in an ABC studio. And what kind of court was it? ... Hicks never got a day in a court to consider his claims - a properly constituted court, which followed accepted rule-of-law procedures ... He was tried by a farcical military commission that the British refused to let its own citizens be subjected to, and that President Barack Obama has denounced as flawed. The Skaf brothers, Ivan Milat and Martin Bryant had their days before a properly constituted court. Was Hicks ever found to have raped or murdered anyone? Do yourself a favour and go out and read this book. It's written in such simple language that even Tim Blair might understand it. I was watching Pakistani satellite TV at my parents' house in Sydney the other day when I saw an unusual character appear on the screen. He looked Pakistani. He dressed Pakistani. But he sounded like something straight out of Little Britain. Dey should be sacked from da team and sent back to da motherland, innit. The GEO news crew back in the Lahore studios were clearly bemused by the passionate selfrighteousness of this and other Pakistani cricket fans in Pakistan and Britain responding to yet another match-fixing scandal involving Pakistani players and possibly officials. The sports presenter poked fun at the Pakistani team manager who had no trouble listening to the orders of his Pakistani administrators back home but had enormous trouble hearing the basic questions of international journalists in London. But in a nation where cricket is perhaps the major religion, this is no laughing matter. Millions of Pakistanis witnessed their team suffer the biggest Test loss in its history. And what made the loss even more humiliating was that it was at the hands of one of the world's weaker teams (England), a team that both Pakistani and Australian cricket fans have become accustomed to poking fun at. journalist Michael Conn recently wrote in The Australian. 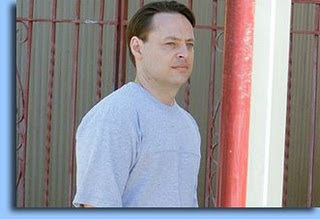 Conn argued that the latest saga was a symptom of broader national corruption. Cricket is widely regarded as a microcosm of the country where it is played, which offers an instant insight into why Pakistani cricket in particular and the ICC in general is such a basket case. If it's as simple as that, how does Conn explain the incident involving Shane Warne and Mark Waugh, who happily took money from an Indian bookie in the mid-1990s? Admittedly they weren't accused of deliberately bowling no balls to throw a game away. But corruption is corruption whichever way you look at it. 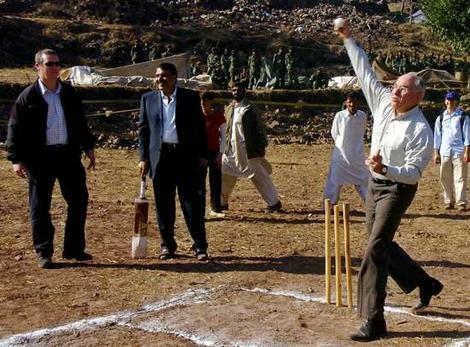 ... whose corrupt administrators blocked John Howard from becoming president of the International Cricket Council. In short, having John Howard as ICC president would solve all of world cricket's corruption problems. We all know that John Howard would never oversee corruption, nor would he allow anyone involved in an administration he was in charge of to have direct links to corruption. Those who claim the Howard prime ministership did not tolerate, whitewash or make excuses for corruption or cronyism would pause for thought if they read Caroline Overington's awardwinning Kickback: Inside The Australian Wheat Board Scandal. They should also ask the new federal member for Denison whether Howard would treat a whistleblower on cricket corruption in the same manner as he treated the Office of National Assessments officer who blew the whistle on intelligence failures that led to a war that killed hundreds of thousands of Iraqis. Everyone knows corruption exists at ICC level. Corrupt governments of nations where cricket is a major sport will happily stack their national cricket boards with cronies. But while many cricketing countries may have corruption issues, others have issues with dealing with racism and parochialism. That support still lingers for a Howard presidency illustrates a peculiar form of parochialism that continues to exist in many Australian circles. Howard supporters argued that the "Afro-Asian" bloc that opposed Howard's nomination to the ICC presidency earlier this year did so because of his attacks on Zimbabwe's racist anti-white government. Howard wanted sanctions against Zimbabwe and was a staunch critic of Mugabe's regime. He was right. If only he was also right when it came to the racist anti- black apartheid regime that ruled South Africa during the 1970s and '80s, a time when Howard opposed economic and sporting sanctions against the regime. Howard's attitude went against the dominant world opinion at that time. Farid Esack, a prominent South African anti-apartheid activist and a gender equity commissioner appointed by the Mandela government, told an American audience in 2006 that the anti-apartheid movement in South Africa saw those outside the country opposing sporting and economic sanctions as being collaborators with the apartheid regime. That presumably includes John Howard. Some would argue that all this talk of Howard's responses to apartheid, AWB, Andrew Wilkie, Iraq (and indeed Dr Haneef, Asian immigration, Pauline Hanson, asylum seekers, the stolen generation) is just ancient history. 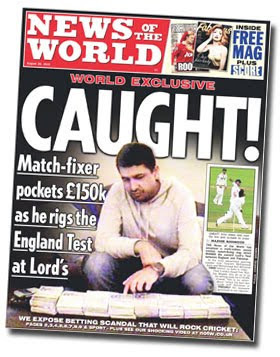 The real issue is cricket corruption. Fair enough. Let's look at this in simple terms. One major element of corruption is that the right job goes to the wrong (and often least qualified) person. Australia and New Zealand had the opportunity to put forward a nominee for the ICC presidency. They had a choice between Sir John Anderson, a top-notch experienced and respected New Zealand administrator, and John Howard. Australia bullied New Zealand into withdrawing Anderson's nomination, despite the fact that he was already pencilled in for the job. And now Howard's backers have the temerity to cry corruption. Irfan Yusuf is a lawyer and author of Once Were Radicals. His top score was 14 runs for the St Andrews' under-14s. He will not be nominating for the ICC presidency in the foreseeable future. This article was first published in The Canberra Times on 1 September 2010.